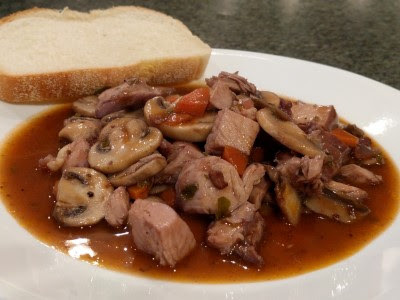 Coq au Vin is a dish we've been regularly making for years but I couldn't find it on my Recipes Page. So when we made it last weekend, I figured I should take some photos and write about it again, making sure to add it on the Recipes Page. It turns out, I have blogged about it before, back in February 2011. We still pretty much follow the recipe in Joy of Cooking; we've modified it a bit to suit our tastes. Instead of 8 oz mushrooms, we use 24 oz. We omit the pearl onions. Sometimes we use fresh, sometimes dried herbs. Nowadays we use the Dutch oven instead of a large pot. After the chicken cooks, we peel off the fat and cut the meat from the bone then toss the chunks of chicken back into the pot. It isn't as "pretty" as whole pieces of chicken topped with sauce but it makes eating it easier. This is still one of our favorite meals to make. It isn't too labor intensive. The kitchen can be cleaned while the meal cooks. We get about 3 dinners from this recipe. It tastes just as good reheated. Season chicken with salt & pepper. Fry bacon in Dutch oven (or large pot) until nicely browned. Remove bacon. Add chicken to pot and brown the chicken on both sides in the bacon fat. Don't over crowd the pan. Remove browned chicken and add remaining chicken to brown. Once all the chicken is browned, set it aside on a plate. Remove all but about 2-3 tbsp fat from pan. Add onion and carrots and cook until softened. 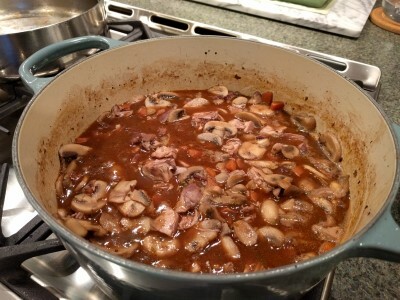 Stir in flour, reduce heat, and stir constantly until the roux turns light brown. Stir in wine, stock, tomato paste, bay leaves, thyme, and marjoram/oregano. Increase heat & bring to a boil. Return the bacon, chicken, and any accumulated juices to pot. Bring to a boil, reduce heat, cover, and cook until chicken is cooked through (about half an hour). Meanwhile, saute the mushrooms in a pan (can use butter or olive oil or bacon fat; we use olive oil). 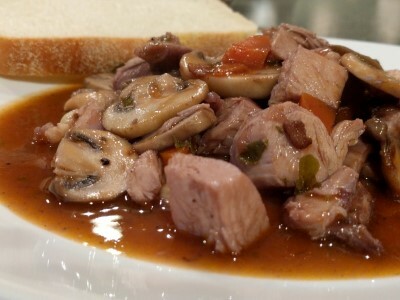 When the mushrooms are cooked, set them aside. When the chicken is cooked through, remove it from the pot. Bring the sauce to a boil and reduce it until it is syrupy. Skim off any fat that accumulates on top the sauce. While the sauce is reducing, remove the skin from the chicken and remove the meat from the bones. 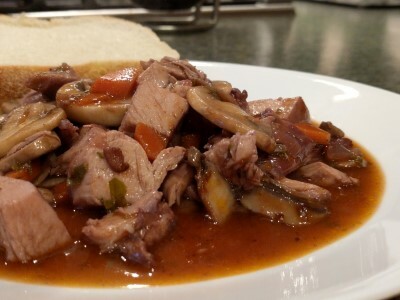 When the sauce is reduced, add the chicken and mushrooms to the sauce, season with salt & pepper if necessary, stir in some fresh/dried parsley if desired, then serve with boiled potatoes, noodles, or bread.